I've recently started deciding to get more serious about my strength training and fitness, and in doing so, I'm actually digging up a lot of old feelings or habits that were once really problematic in my life. There was a period of time when I was obsessive about perfectly tracking every calorie I consumed and when; where I was spending a ton of money at GNC buying protein powder (without really knowing why I needed it, or if I really did) and fat burners that I consumed like candy; when I would sit there sweating and feeling my heart pound as a result of all the stimulants and feel afraid that I was doing something bad to my body, but then I would go home and lift my shirt up in the mirror and imagine the barest hint of an outline of an ab muscle, and convince myself that everything would be okay as soon as I lost 10, 20, 50 pounds, maybe more. "Some girls who are my height are even under a hundred pounds," I mused to myself. "Maybe if I work hard enough, I'll get there." Of course, I never got there. And day in, day out, my life thrummed with a constant undercurrent of self-loathing for not being thin and pretty. I've come a long way since then. I don't hate my body anymore, and I have learned to care far more about what it can do than what it looks like, but right now it kinda feels like hiking in the woods and knowing the cliff's edge is somewhere nearby, but you're not sure how close you are to it. I feel like my mind is walking that fine line between being serious and being obsessive, and I find myself constantly having to talk myself down. I'm tracking my meals again, but it's not to lose a ton of weight drastically; it's to make sure my body performs the best that it can when I run or lift. I'm taking supplements again, including a (stimulant-free) fat burner, because building muscle and losing some of the fat will help me run faster or lift heavier. I'm looking at my counter-top full of powder-filled jars and shaker bottles, and I'm seeing a version of me that looks remarkably similar to the old me, and it worries me quite a bit. One thing is different though: the self-loathing is gone. I know without a doubt that, before, I was trying to beat my body into submission, and hating myself when I failed. Now, I'm trying to treat it with care, to honor my body and its limitations, to not see all my actions as "pass" or "fail," but to see each step as an achievement in itself on my journey to... something. I don't have an end goal, like a specific weight, but just a general plan to feel good physically, mentally, and emotionally. What changed? If I could pinpoint one time in my life where things really started to turn around, I would have to say that it was when I started getting involved in roller derby. I stopped over a year ago, officially, but I feel the impact that roller derby made on my life every single day, and maybe that's why I constantly miss it and I still haven't really let go of my derby name/identity. Why I still feel like I'm a part of it, even though my skates are collecting dust in my garage. 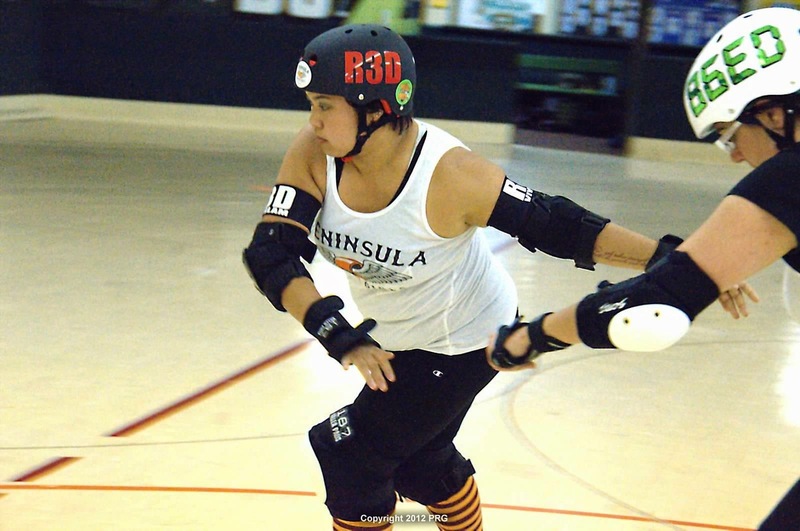 As much as roller derby has grown since its inception, it's still very much a niche sport. There are still many who think it's just about lipstick and fishnets and fake fights. It's still a sport where most of the time, when it comes up in casual conversation, people require an explanation of the rules. (No one ever needs to explain the point of soccer or basketball, right? Although, I still don't understand football.) As a sport that exists on the fringes of the sports world, it also attracts people who tend to exist on the fringes of life, in the sense that you rarely ever see a sports team that is such a large collection of punk girls, rockabilly girls, goth girls, fat girls, genderqueer girls, transgender girls, pansexual girls, poly girls, etc. I met "types" of people I'd never met before. I use the word "types" with bunny-ear quotation marks because no person should be reduced to a type, of course. What I mean to say is, my world expanded exponentially when I joined a roller derby league. Of course, the roller derby community is as diverse as the world is, but there must be something special about it that draws us all together. It wasn't just a workout or a random hobby - it was a universe. There's a saying that goes "The derby monster ate my life," and we all affectionately chuckle at it because it's true. You don't just play roller derby; you live roller derby. It consumes you. And it never wants to let you go. I found a home in the roller derby community, and it was there that the broken parts of me started to heal. For the first time in a long time, I was learning how to train, rather than just exercise. For the first time in a long time, I was focusing on my body's performance, rather than its appearance. I wasn't just a girl trying to lose weight anymore; I was an athlete. And it's amazing what a difference that change in terminology makes. I'm not saying that athletes are immune to self-esteem and body image problems, but I'm saying that becoming an athlete gave my body a purpose other than to look pretty. And roller derby nurtured those feelings of positivity. Derby chicks are fierce. They're badass. They hit hard, and they don't take crap from anyone, on the track or off. I had found one of the few pockets of society where it was okay to be larger, where it was actually helpful to be a big girl, and I learned how to exercise and eat healthily and how to appreciate my body rather than beat it up all the time. (Well, there was a fair amount of beating up too, but of a different sort.) I lost weight without actually trying to lose weight, and moreover, I didn't really care that I had lost weight. All I cared about was spending my time skating with some of the most amazing, empowering people I had ever met, and I was happy with myself and my body. Roller derby helped me find my feminism, which is still an on-going journey for me, but this eventually helped me learn about things like the prevalence of Photoshopping in the media, which made me hate myself less when I looked at magazines. (Actually, I stopped reading magazines altogether, except for ones about running, knitting, and feminism. That really helped a lot.) Also, it was roller derby that led me to Crossfit and Paleo, which taught me about functional strength and finding the right way of eating for my body. While I don't do either of those anymore, I will be forever grateful for the positive impact they both had on my life, because they both made me healthier and happier about my body. I don't play roller derby anymore, but I feel its presence in my life every day. Roller derby changed the way I look, and it also changed the way I look at myself. My large body that I resented for so long is now an asset rather than a burden, and as I embark on this next phase of my athletic life, I will never forget that time in my life when I finally learned that I was capable of being awesome and that it had nothing to do with the numbers on my scale or the tags in my clothing. I pretty much still carry a bit of Viva Glam with me everywhere I go because she was powerful and unafraid, and when I feel my strength slipping, I call upon her. It's her strong legs pushing out of the bottom of a back squat and finishing strong at the end of a 20-miler. You can take the girl out of derby, but you can't take derby out of the girl. I owe my body and my sanity to roller derby, and I'm thankful for it every day.